3 Beds 4 Baths 1 Partial Bath 1,394 Sq. ft.
NEW PRICE! Open House 9/24 12-2. 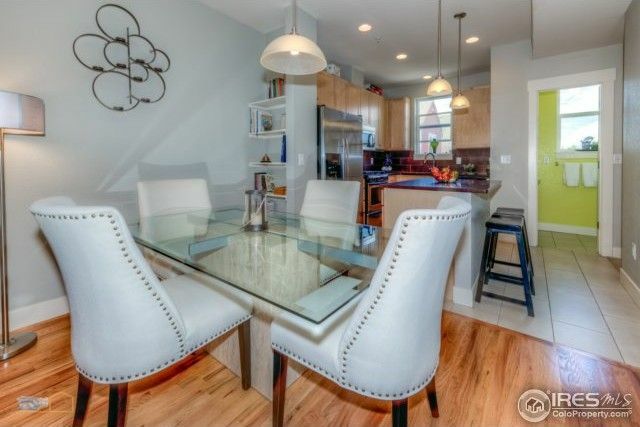 Super chic 3 bed/4 bath townhome in N BLDR. Fantastic open layout on main level w/ 9' ceilings flowing out to covered balcony w/ mountain views to the south. All bedrooms have private full bath & walk-in closet. Upscale finishes include quartz slab counters, maple cabinets,hardwood & tile floors, stainless appl. Includes your own courtyard & 1-car attached garage. Low HOA fee. Walk to Amante, Holiday shops, RTD & trails. Great for investor or owner occupant.